Clean and julienne sweet red pepper and saute’ in olive oil until al dente’. Meanwhile, cook or steam green beans to al dente’ and drain. 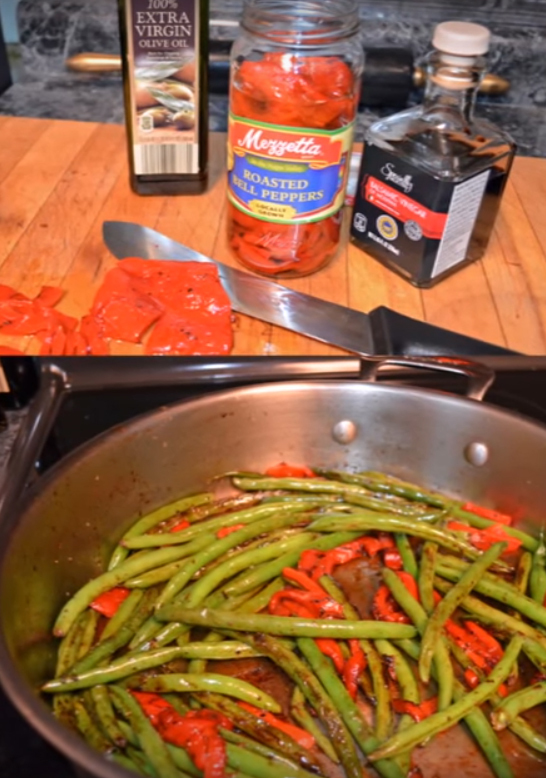 Place hot beans in the skillet with sweet red pepper, add a little salt and pepper, sprinkle with balsamic vinegar, tasting once or twice adding olive oil if needed. What you want is to just barely taste the balsamic vinegar, more so that it brings out the flavor of the beans and doesn’t dominate the dish. Stir until coated. Serve warm or at room temperature. This is one of my favorite, go-to recipes. It is suitable for any season of the year. I usually use fresh green beans, but in the winter, if you can’t get good ones, you can do this with frozen (or even canned) green beans. This entry was posted in Cooking Light, recipes and tagged balsamic vinegar, green beans, roasted red peppers, sweet red peppers. Bookmark the permalink.